KITC Computer Tip: If a student isn't seeing a specialty software tab in Excel, such as Bloomberg or Macabus Lite, have them restart the computer. When it comes back up, the computer will be in the default lab load and the specialty software tab will be available in Excel. Find a wide variety of information on various content areas worldwide - corporate bonds, mortgage-backed securities, preferreds, equities, commodities, futures, options & spot rates, world financial markets, economic indices and currencies. An overview workshop is suggested before undertaking major use of the terminal. Search by ticker or company name. Provides comprehensive coverage of companies: financials/valuation, transactions, business relationships, filings and investments. Sophisticated charting and screening tools. Includes extensive information and analysis on international funds including hedge funds, money market funds and exchange traded funds (ETFs) as well as stocks. Contains screening and portfolio management tools. This institutional investment research tool incorporates ratings and rankings of over 55,000 domestic and international stocks. Includes quarterly company performance and detailed fundamentals data, sponsorship and investor information, over 8,000 securities, and technical data. Equity visualization using datagraphs, pattern recognition, revenue lines, and earnings estimates. The datagraph formatting streamlines the analysis process to evaluate merits of a stock and your portfolio. Help: Within PANARAY, click on the PANARAY home icon in the lower left to find a help tutorial. Access SEC filings current and historical, the Worldscope database, key ratios, LIBOR, and currency exchange rates. View real-time global financial market data, such as, mergers and acquisitions deals, estimates, company ownership data, and private equity/venture capital data. This database also contains equity screening tools. Use the Thomson ONE toolbar while in the library to access data in Excel. Trading simulations and tools for financial education and research. Offers interactive trading simulations with price discovery, virtual portfolio management and additional research and analysis tools. Includes research by Value Line analysts on common stocks of small, mid and large-cap companies, stocks of emerging growth companies, mutual funds, stock and stock index options, convertible securities, as well as access to all Exchange Traded Funds (ETFs) listed in the United States and Japan. Click on Industry Survey from the main menu. Choose an industry from the dropdown list and click Search. To see all the available reports for that industry, click the funnel icon next to Date/Time and choose All History from the dropdown. Then, click Apply Filter. For the US NAICS Industry reports, search by company, industry keyword, or NAICS code. For the US Specialized Industry reports, search by company or industry keyword. Find trends, statistics and analysis on market size, market share of competitors, supply chain information, and industry growth rates. For the US NAICS reports published after 2016, the Key Statistics section includes RMA Annual Statement Studies industry ratios. U.S. and international public companies' data includes industry reports for global regions, competitors, annual reports, equity pricing, insider trades, subsidiary ownership, and executive biographies. Contains financial data for publicly traded companies including 15 years of financial statements, 30 years of stock prices and long-term debt information including matured bonds. Information for some 'inactive' companies is also available. Access freely available information on many types of investing including stocks, funds, and currencies. View market, stocks, funds and ETF's information courtesy of Thomson Reuters. Company and industry ratios are available under 'Financial Results' and then 'Key Ratios.' Includes a Ten Year Summary section for some ratios. Restricted: Only current SMU students, faculty, & staff. Certificate students and alumni do not have permission to use these resources. 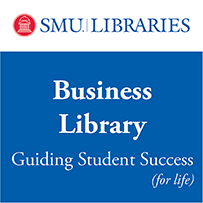 EZ: Off-campus access using 8-digit SMU ID & password (or your last name and 14-digit SMU ID barcode number). Access these databases - anytime, anywhere. In Library Only: Accessible only on Business Library computers and are not accessible via wireless connections. A current SMU ID card must be presented to receive a placard that must be displayed while using the computer.